Cost (2018–2019): Tuition is $40,208; room and board is $12,684. Financial Aid: Approximately 90% of the full-time student body receives aid from the College and federal and state sources. The College offers renewable merit awards to qualified students in support of academic excellence and student leadership. Academic Reputation: The Princeton Review named Assumption one of The 380 Best Colleges, and U.S. News & World Report ranks Assumption as one of the best universities in the Northeast. The College has had 18 NCAA Postgraduate Scholarship recipients, more than four times the number of any other college in the NE-10 Conference. 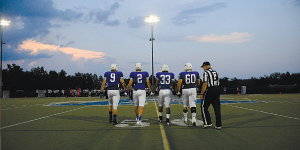 Athletics: Assumption competes in NCAA Division II and is a charter member of the Northeast-10 Conference. There are 11 intercollegiate men’s teams (baseball, basketball, cross-country, football, golf, ice hockey, lacrosse, soccer, tennis, and indoor and outdoor track) and 13 intercollegiate women’s teams (basketball, cross-country, field hockey, golf, lacrosse, rowing, soccer, softball, swimming & diving, tennis, indoor and outdoor track, and volleyball). Assumption College has been lighting the way since 1904 as students pursue a robust educational experience grounded in a classic liberal arts curriculum and rich academic programs in business and professional studies. The College founders, the Augustinians of the Assumption, understood the true value of the Catholic intellectual tradition in the cultivation of both the intellect and personal values of students. Today undergraduates, graduate students, faculty, and staff thrive in the intellectually stimulating, dynamic, and supportive community. 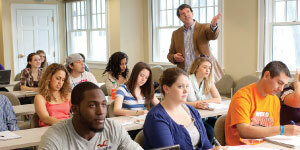 Assumption’s 2,000 undergraduates can choose from among 35 majors and 47 minors. The education is formative and transformative—developing a student’s mind, heart, and soul. Some of the most popular liberal arts disciplines include English (with concentrations in Literature or Writing and Mass Communications), History, Political Science, Psychology, and the natural sciences—Biology, Biotechnology and Molecular Biology, Chemistry, and Environmental Science. Other popular academic programs include Education, Human Services and Rehabilitation Studies, and business disciplines such as Accounting, International Business, Management, Marketing, and Organizational Communication. To smooth the transition to college, Assumption’s COMPASS (Common Pursuit of Academic and Social Success) program is an integrated, comprehensive experience for all first-year students that fosters success in their academic, social, and student lives. The Academic Support Center provides free peer tutoring and a professional staff who can assist students with specific subject matter. Practical experience is essential to future success. Assumption connects students to a wide variety of local, regional, and international internships, and over 84% of 2018 graduates participated in an internship or experiential learning opportunity. Assumption has its own campus in Rome, Italy, or undergraduates can choose among 50 other study abroad sites. On campus, Community Service Learning courses and the Reach Out Center connect students with nonprofit agencies, schools, and individuals who can benefit from students’ knowledge and skills. The Career Development and Internship Center works with students to set individual goals, explore academic interests and career options, and build a résumé. Success begins on day one. Assumption faculty are active teacher-scholars in their disciplines who present their research at conferences, write books and articles, and get published in highly regarded journals. There is a strong commitment to developing each student’s potential, and with a student-faculty ratio of 11:1, professors get to know their students and mentor, encourage, and help them succeed. Virtually all of Assumption’s academic advisors are full-time faculty. Assumption is in a beautiful residential neighborhood just minutes from downtown Worcester, Massachusetts, the second-largest city in New England. 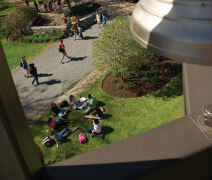 On-campus housing is guaranteed for all four years, and 85% of undergraduates live in a variety of traditional residence halls, suites, and apartments. The campus is active seven days a week with more than 60 student clubs and organizations and many campus events—from movies and concerts to theatrical performances and intercollegiate, club, and intramural sports. The vibrant Campus Ministry programs provide students with rich opportunities to deepen their faith and spiritual growth. Worcester is a college town, home to 35,000 students and great restaurants; cultural, retail, and entertainment options; and professional sports teams. The campus is an hour’s drive from both Boston and Providence, and there is frequent daily train service to Boston. The College has heavily invested in its facilities and technology. The 60,000-sq. ft. state-of-the-art Tsotsis building houses high-tech classrooms, seminar space, and study rooms. The stadium and athletic facilities support Assumption’s strong intercollegiate teams and the physical well-being of the entire campus. The beautiful Chapel of the Holy Spirit is at the heart of campus. Whatever a student’s faith, the Assumption experience helps develop a set of values that encourages students to use their knowledge in service for others. It’s an atmosphere that’s intellectually challenging, personally rewarding, and spiritually fulfilling. Assumption College is where the spirit of learning and community thrives and lights the way for others to follow.